Team Canada to a gold medal win at the 1997 World Women's Championship in Kitchener, Ontario. When the Hockey Hall of Fame amended its by-laws in 2009, it opened the door for the first women to be inducted as Honoured Members, and along with Cammi Granato, Angela James was the first woman to be elected to hockey's hallowed Hall. Born December 22, 1964 in Toronto, Ontario, Angela James began her hockey career in much the same way as most children do. "When I was a young kid, I didn't think hockey was just for boys. I thought everyone played hockey," she states. "That's what we did as kids. I would play on the outdoor arenas until the lights would go out or shoot tennis balls against the walls until I couldn't see any more." At the time, there were no organized leagues for girls, but that didn't prevent Angela from playing hockey. "I started playing hockey at the age of eight with the boys in Flemingdon Park (a Toronto neighbourhood). After a few years, I went to women's hockey and enjoyed going through the minor hockey system within the old Women's Hockey Association." to numerous OWHA league and provincial titles. Angela admits that hockey helped kept her on a path away from temptations. "Hockey is a passion for me. It kept me out of trouble. I started wandering a bit, and my coach at the time sat me down and talked to me like no one had before. He explained to me that one thing can lead you to another and I needed to understand where this would take me." Angela eventually played hockey at Seneca College, and led her team to several championships. Later, she was honoured by having her number 8 retired by the Toronto school. Beginning in the late-1970s, Angela played in the Ontario Women's Hockey Association (OWHA), and dominated the league. She led her teams to numerous OWHA league and provincial championships and was the leading scorer in eight seasons and the most valuable player in six. "The OWHA gave us opportunities to play at so many levels," she said. Her style was described as a combination of the aggressiveness of Mark Messier combined with the pure goal-scoring talent of Mike Bossy. 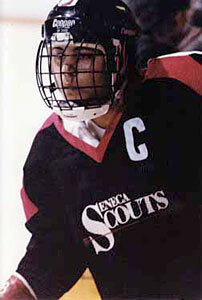 In 1990, James was selected to join Canada's team at the inaugural Women's Championship, held in Ottawa, where she led the team to the gold medal with 11 goals in 5 games. She also led the Women's Team to gold medals in 1992 in Tampere, Finland, 1994 in Lake Placid, United States and 1997 in Kitchener, Ontario. In 1996 and 1999, James led Canada to gold medals in the Three Nations Cup. Another gold medal was earned by the James-led Canadian team at the Pacific Rim International tournament. into the IIHF Hall of Fame in 2008. In a highly controversial decision, Angela was excluded from Team Canada's Women's Team for the 1998 Winter Olympics, the first time women's hockey was played in the Olympics. The hockey world was stunned -- from 1987 until that point, James had been Canada's greatest scoring threat. In 2005, Hockey Canada honoured Angela with the Female Breakthrough Award, given for making significant contributions to the promotion and/or development of hockey for girls and women in Canada. "Hockey Canada continued to put the resources into the women's game so we could remain number one in the world." 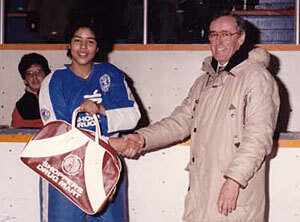 Angela was inducted into both the Black Hockey and Sports Hall of Fame and the Ontario Colleges Athletic Association (OCAA) Hall of Fame in 2006. In 2008, she was one of three women inducted into the International Ice Hockey Federation (IIHF) Hall of Fame, the first in the Federation's history, joined by Cammi Granato and Geraldine Heaney. Canada's Sports Hall of Fame inducted James in 2009. A superstar in women's hockey, James has received numerous other career awards and accolades. She won a Youth of the Year Award in 1985 and was recognized by the City of Toronto as one of its Women in Sport Enhancement in 1992. In 2008, the Angela James Bowl was instituted, awarded annually to the leading scorer in the Canadian Women's Hockey League (CWHL). Flemingdon Park Arena was renamed Angela James Arena in 2009. 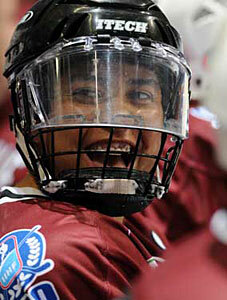 In 2010, Angela James made headlines when she was welcomed into the Hockey Hall of Fame. "I feel so very, very privileged to be one of the first females to lead us into the great Hockey Hall of Fame."